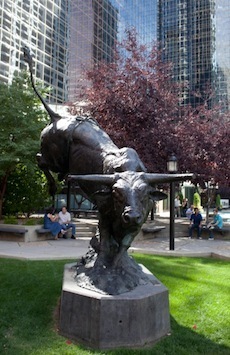 These horseshoes represent the strength of the iron that protects their animals from harm. 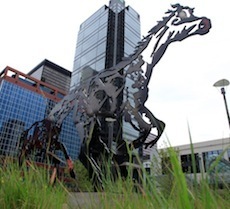 This art installation honours the champions of the Calgary Stampede rodeo and chuckwagon races – the very heart of the annual celebration – people bringing forward their best and achieving excellence. These are the men and women who finished first in their respective events. 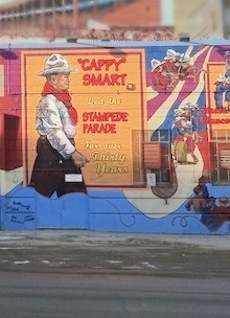 This mural was created to commemorate the 100th anniversary of the 1901 bull sale. 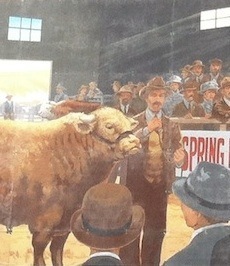 Sixty-four head of purebred cattle were sold through the first bull sale held by the Territorial Purebred Cattle Breeders Association on April 12, 1901. 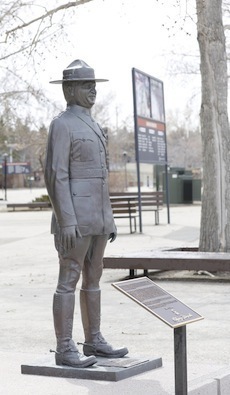 From 1996 - 2002, Superintendent, Dennis Massey volunteered countless hours to proudly walk Stampede Park interacting with the public on behalf of the R.C.M.P. and its initiative to enhance community policing. 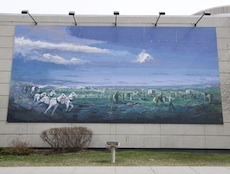 As one of the largest pieces of art in North America, this is an ensemble of 15 horses and two cowboys that blends historical and modern day images into a larger-than-life exhibit that reflects the spirit of Calgary - from the influence of the Bow River to the significant role of the cowboy and the free spirit of the western horse. 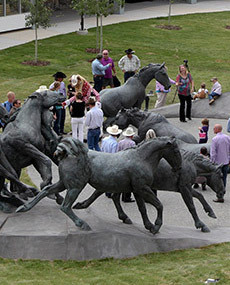 This sculpture's low and high relief work captures the essence of the chuckwagon teams stampeding and pounding together in close competition. 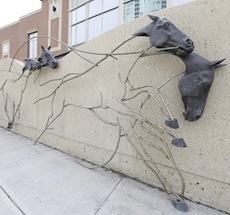 The heroic-size bronze sculpture of eight horses in motion celebrates the sister-city relationship that exists between Calgary and Quebec City; it a tribute to the past, present and the future of the two cities. 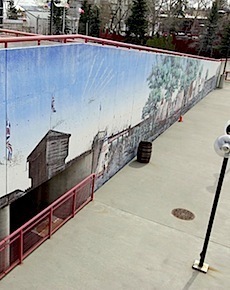 This mural depicts the first chuckwagon races in 1923 and was commissioned in honour if the 75th anniversary of the GMC Rangeland Derby. 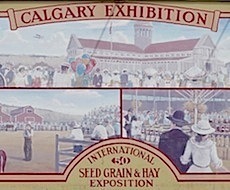 This mural shows the early seed and hay exhibitions hosted in Calgary since 1886. 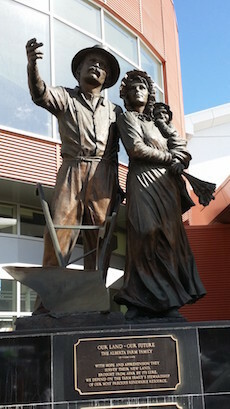 This bronze was created to celebrate the 100th anniversary of the Calgary Agriculture Exhibition (1886 – 1986) and is dedicated to Alberta farm families. 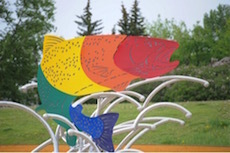 The Elbow River is home to several species of fish, one of the most sought after by anglers is the rainbow trout. Fish, geese, ducks, hawks, squirrels, beavers and coyotes are all part of this ecosystem. 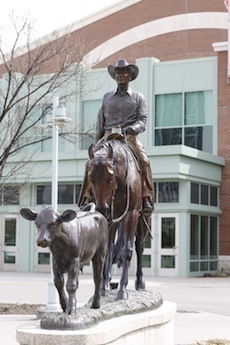 As the largest private landowner along the Elbow River in the city, the Calgary Stampede takes environmental protection seriously and is the proud custodian of urban spaces and natural areas – including ENMAX Park. 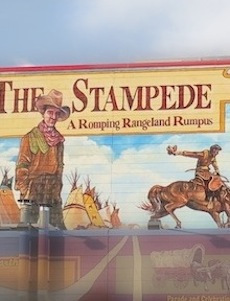 The theme for this mural is the 1950s and 60s entrance to Stampede Park. The color and excitement was heightened by the location of Indian Village and its traditional tepees in Sun Tree Park. 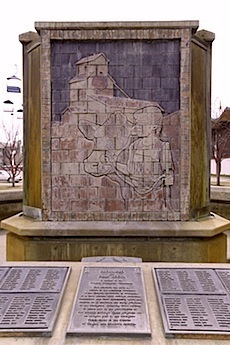 This statue is based on a drawing done by well-known California artist, Edward Borein which was the inspiration of the 1919 "Victory Day" Stampede celebrating the end of World War I. 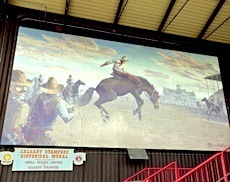 This mural depicts Guy Weadick's hopes for The Greatest Outdoor Show on Earth. 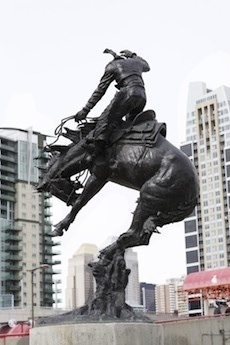 The First Nations of Treaty 7 have always been an important part of the Calgary Stampede. 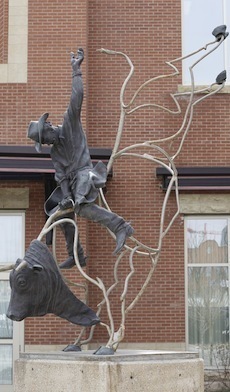 In 2012, the Calgary Stampede centennial year, this piece was unveiled at the main entrance commemorate and celebrate the century-long relationship between the First Nations and the Calgary Stampede.